BPWrap found an interesting tidbit in Google's international sites: in some cases, the snippets start with a date that is displayed in the same language as the Google interface. For example, Google France displays "9 juil 2006", even if the page contains an English date: "July 09, 2006". What's even more interesting is that Google doesn't include any date from the page: it tries to detect the most likely candidate for the published date. This should be more accurate than the date when Google first found a web page. Most news sites and blogs display the date when an article has been published and this is an useful information for people who try to find recent news articles or blog posts written in a certain period. Example of queries that show the published date in Google's snippets: [extended Google snippets], [Microsoft bid for Yahoo], but I'm sure you can find many others. The new date could replace Google's current estimation that is used in an advanced search option. For web pages that don't include the date when they were created, Google could try to estimate it, based on its content and the recency of the linked web pages. This is not the only information automatically detected by Google and displayed as part of a snippet: the map plusbox includes the most relevant address identified on a page, a static map and links to directions. Can I just ask... are you French or do you speak it? Or do you just like it? I know I like it. You always seem to use it as an example when we're talking about international Google. Sorry, I didn't mean that to sound like a criticism. I think French is a great language and I've been studying it for a while now. I just wondered why you always stuck to French. 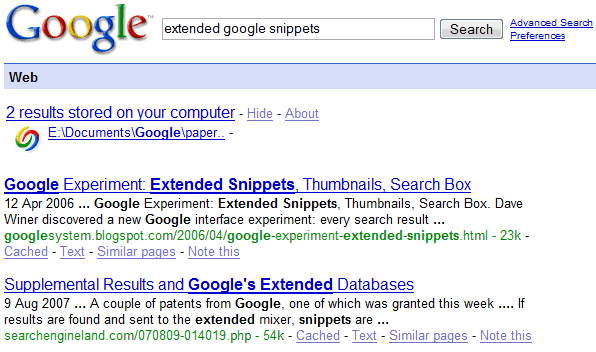 I always wanted a feature like this...I wonder why Google can't just get the date from the page's file? Maybe servers don't let you do that? Yes, I love French and France's culture, but I don't think there are too many posts that use French as an example. Only 31 from more than 2,300 posts include "French". The number of posts for other languages: Chinese - 27, Spanish - 26, Italian - 21, Portuguese - 10. Google could use the Last-Modified HTTP header, but this shows the date when a page has been last modified and it's not useful for dynamic web pages. Really? Oh, well perhaps I just remember the French ones more. We can't see this on every results. Under what condition do you think we can see it?